Groups engaged in confrontations with Governments, antagonist parties or with forces that are occupying disputed territories, are often on the edge, and can feel the need to resort to terrorist practices (Hoffman, 2006: 23-24-26). When this choice is made, they try to disseminate their ideology as much as possible and in this way try to increase the number of their active and passive supporters (Hoffman, 2006: 28). Ropoport (2012: 41-42-43), accounts for four waves of terrorism of which, the end of the third and the whole of the fourth are noteworthy for this essay’s purpose. They refer to a transformation of some Middle Eastern terrorist organizations, from nationalistic to religious and, in the fourth wave, give a full insight into the dynamics of those organizations which while originating from within the religious wave develop particular characteristics into a much wider framework. A short background of the historical and political context behind the Islamic terrorism will be provided to address some of the possible causes of the same. The Salafist/Jihadist creed/doctrine and developments will be analyzed as the funding principles behind two contemporary and wide spread bloody Islamic terrorist groups, de facto representing the third millennium of the phenomenon. The diffusion and growth of Islamic terrorist groups will be debated. In this section, two short case studies, respectively on Al Qaeda and the ISIS, functional to show the status quo of the phenomenon, will be explored. The main outcomes that determine the spread and expansion of Islamic terrorist groups in the contemporary world will be summarized and therefrom, specific conclusive considerations will be drawn. Hoffman (2006: 43) dates the initial terrorist acts of the contemporary world, after the end of the Second World War. He addresses them as part of the ‘anticolonial- and postcolonial-era’. Using the case of colonial Palestine as illustration, he points out how the Jewish terrorists, in their bid to coerce Britain to accede to their requests, exploited the clear international concern about the harsh reactions of the British when attempting to block the actions of the Jewish terrorists (Hoffman, 2006: 46-50). Ropoport (2012: 51) accounts for an overlay of ethnic and sacred motivations for terrorism already in his third wave. Correspondingly, only in the fourth wave he posits religion and Islam in particular, as the central catalyst for the phenomenon. In addition, sundry scholars (Migaux, 2007: 256); Fine, 2008); Springer et al, 2009: 22-26); Ropoport, 2012: 52), individuate, in 1979, two major events triggering Islamic terrorism: the Iranian Revolution and the Russian invasion of Afghanistan. Consequently at the time, Iran backed and stimulated Shi'a terrorism in the Middle East and in Arabian Peninsula, whilst Sunni volunteers were supported by US against Soviets in Afghanistan. Accordingly, Lebanon, with its multifaceted religious actors (Shi'a, Sunni and Druze Muslims, Maronite, Greek Orthodox, Greek Catholic, and Armenian Christians) became the battlefield for bloody statements, propaganda, and terrorist training camps (Pike, 2011). Subsequently, the Palestine dispute became the epitome of where two ethnic groups, two creeds, one territory, the holocaust and the end of an international obligation defined the status quo, and rose as Islam’s flag. For long time, the Palestinian struggle, embodied (and provided a justification) in the Muslim world, the need of firm actions against the occupation of territories and Holy sites (Springer et al, 2009: 20-21); Al Raffie, 2012: 18). Leaving out Abd al-Wahhab and Ibn Taymiyya, contemporary groundwork of the Salafist creed, dates back in the mid-sixties when the Egyptian militant of the Muslim brotherhood, Sayyid Qutb, wrote a guide, named Milestones. Being the base for the document, the Quran is taken as the fundament of Islam and along with the Sunnah, as the only truth above all the other possible creeds, that by default, resulted into their status as being fraudulent and repressive (Rabasa et al, 2006: 11); Stout, 2009: 878); Al Raffie, 2012: 17); Hayat, 2014: 38-39-40-41). As consequence, Qutb forecasted a time, yet to come, where it would be possible to worship Allah in the unique correct way as per his interpretations of the holy texts. The idea of Allah as the only entity to accede obedience, and the rewards connected to this, is present in many parts of his narrative (Stout, 2009: 878); Hayat, 2014: 38-39-40-41). In his book, he proposed that until then, the whole of the Muslim people (Ummah), had been influenced and spoiled by false ideas, and due to a profound ignorance (Jahiliyya) coming along with the latter. Therefore, the leaders had to be thought to live and rule according to the Islamic commandments (Sharia) to be further enforced in all Muslim territories along with disseminating the teachings among the Muslims around the world. Whoever would not follow these would be judged according to the takfir, considered the apostate of Islam, and candidate for castigation through death. (Rabasa et al, 2006: 11); Stout, 2009: 878); Al Raffie D. 2012: 15); Hayat, 2014: 38-39-40-41). Stout (2009: 878), highlights how, for Qutb, and the following Salafi jihadists (among others Ayman al-Zawahiri and bin Laden), there is a clear distinction between Muslims and the rest of the world, conveying that firmly following these ideas, would grant them the ultimate victory through Allah. The ultimate end goal of the Salafi jihadist, is re-establishing the Caliphate as it was in the ancient Arab world going from Andalusia to the most remote Muslim strongholds in Asia, in order to create the optimum environment to implement the Sharia and so, allow the Ummah to follow Islam in the way Allah requires (Migaux, 2007: 256); Stout, 2009: 879). Last considerations for this part of the paper, cannot leave aside the fact that modern Islamic terrorist groups, namely al Qaeda, ISIS –the Islamic State - and many of their affiliates, have developed rhetoric narratives, that benefiting from deep knowledge of the West, allowed their well-educated strategist, to include approaches, tactics and ideologies hired out from Marxism-Leninism in general and from revolutions around the world in particular (Rabasa et al, 2006: 10-11); Stout, 2009: 881); Al Raffie, 2012: 14-15-16). Because of the narratives they developed, one established account, contemplates the Ummah misery, her dishonor, and subjugation due to dishonest regimes and their aberration from real Islam as a result from historical foreign influence. Approaching and providing at ethno-social level an easy motive for their fate, and exploiting existent criticisms, terrorist groups try to go straight at the heart of the people (Al Raffie, 2012: 17). As previously seen, the Iranian revolution, and the Russian invasion of Afghanistan, ignited fuel on an already blazing environment. It is interesting to note that Shi'a terrorism, although having revolutionary origins stayed pretty much confined in the countries where the terrorist organization was operating and/or, in the nearby countries where was convenient exercise some form of influence (Hayat, 2014: 38-39-40-41). On the contrary, Jihadi terrorism moved and expanded accordingly to needs and opportunities as they presented. It is worth highlighting, that despite the confrontation among these two currents, Jihadi terrorism, to some extent, borrowed the revolutionary connotation of Shi'a, to support what they define as a revolutionary global counter-crusade. While from time to time, and erratically, they supported each other with subtle propaganda statements (Huntington (1993: 35); Hayat, 2014: 38-39-40-41). Migaux (2007: 292-293) and Hayat, (2014: 41), among others, share the same view on the relevant Afghanistan events in 1979 and about the reasons why US, Saudi Arabia and Pakistan, supported the Mujahidin. The main objective for the US was containing USSR, and in some extent Iran as well, in yet another proxy war. Saudi Arabia after few terror attacks, wanted to have a sort of control on young Sunni extremist also in order to have a possible weapon available, whilst for Pakistan was enough to fight an India supporter (Migaux, 2007: 292-293); Hayat, 2014: 41). Afghanistan was the place where all the Muslim had to fight the Jihad, a battlefield where weapons, training, and money where widely available. Extreme interpretations of the Quran were thought in order to motivate and commit volunteers arriving from the Muslim world reaching a peak of 20,000 in 1980 (Migaux, 2007: 292-293); Hayat, 2014: 41). From the Afghan war, two different outcomes heavily contributed to the spread of Islamic terrorism. First, due to the Soviet defeat, blind believers and able Muppet masters conveyed the universal message, that Allah had rewarded his fighters with invulnerability leading them to victory (Fine, 2008). Second, these well trained, fearless, and now extremely radicalized fighters were mostly returning to their countries. Migaux (2007: 293-297) accounts for at least 17 different countries where these Jihad’s Mujahidin, returning, have become a reference point for local extremism. Huntington (1993: 24-32), points out, that diverse cultures can be ‘defined both by common objective elements, such as language, history, religion, customs, institutions, and by the subjective self-identification of people.’ Additionally, he highlights an ongoing ‘Clash of Civilizations’, where the Muslim world feels threatened by the West. Following the Gulf wars and the enduring deployment of western forces in the Arabic peninsula, Islamic terrorist groups spread the idea that Islam and the Arab civilization was under attack. Oil reserves and Holy sites virtual occupation, provided the needed evidence for the concept. Furthermore, local governments under external influence were buying western weapons. It is easy to understand how these arguments enabled, a high degree of self-identification among Muslims. Al Qaeda has had a significant role in the spreading of Islamic terrorism. It represents the ground zero of real and active terrorism’s internationalization. His leader, Osama bin Laden and his seniors, like Ayman al-Zawahiri, shaped a message fully exploiting the tensions between the West and the Muslim world. The base, as they named it, as first worldwide terror enterprise, acted as catalyst for projecting Ummah’s grievances and frustrations, on the west in general, and on US and Israel in particular. (Hoffman, 2006: 93); Lutz, and Lutz, 2013: 274). The terror network started using the worldwide Mujahidin’s contacts and, their local linkage along with the ones naturally created by migration, (Goldstein Ferber & Schweitzerand, 2005: 7); Hoffman, 2006: 93); Lutz, and Lutz, 2013: 274), gathering, and controlling members, through the ideal of self-sacrifice, istishhad, as new frontier of the Jihad; being a martyr to be the struggle and fearless for terrain life (Goldstein Ferber & Schweitzerand, 2005: 7). Al Qaeda organization, aims and actions evolved through diverse stages. At the beginning (early 1990s), it provided support for other groups. By 1998, the activities concentrated on the building of a radical Islamic network against Israel, the Jews and the countries perceived as invaders. Eventually in 2001 a solid organization was in place (Goldstein Ferber & Schweitzerand, 2005: 17-18). During the network evolution, actions like the 1993 first attack on the World Trade Center, the bombing in Khobar and Dahran, the 1998 simultaneous attacks at the U.S. embassies in Kenya and Tanzania, and the 2000 U.S.S. Cole, showed global capacity for bloodshed. (Goldstein Ferber & Schweitzerand, 2005: 19-20). After the invasion in Afghanistan as consequence of 9/11, the defeat, and the killing of the leader Osama bin Laden, a new and more flexible organization has been shaped in order to continue the global struggle. Thought operations of associated networks, as showed in Bali – 2002, Madrid - 2004, London - 2005/2007, and Mumbai – 2008, al Qaeda has had a large degree of visibility pursuing the goal of having a world ruled by Islam (Goldstein Ferber & Schweitzerand, 2005: 26); Lutz, and Lutz, 2013: 274). The last aspect accounting for the spread of Islamic terrorism, is the circumstance that feeble governance in the majority of Islamic countries, including corruption, dictatorial behaviors and dead end in controlling the territories, bear out terrorist narratives. Weak or unfair Governments, undermines society’s trust, and this is especially sensed, when they are backed up by a western country (Huntington, 1993: 32); Springer et al, 2009: 8-9). Spread and expansion of Islamic terrorist groups are subtly connected. Muslims are currently fighting under the same Islamic flag in the Middle East, in Asia, in different regions of the former USSR, in China, in Pakistan, in India, in Africa, and have had major conflicts in east Europe. Islamic terrorist are committing acts of atrocities in all of these countries, in the nearby ones and in all the others deemed responsible for Islam’s decadence. Contemporary world, with all the technological advances brought the expansion to a level never seen before. One aspect of the terrorist attacks is that they have to be memorable. This is required in order to frighten the population and possibly pursue the main aims of the group. They have to gain visibility among other comrades, pushing to emulate the gesture and convincing that the tactic is working showing that there is no alternative. When the action is planned, the media coverage of the act is usually taken in consideration, offering footage and recorded interview of the suicide bombers. The value to pay, is that when the media cover such events, they invariably to some extent also authenticate them (Hoffman, 2006: 173-174-175). Correspondingly, terrorist organizations have developed new capacities compared to the passive media coverage and the possible spread/broadcasting through clandestine radios or printed materials. All the previous means, neither were controllable nor could reach very far. Islamic terrorist groups, have shown deep media handling knowledge, both as creation and marketing (Hoffman, 2006: 197-198); Rabasa et al, 2006: 164). Therefore, suicide bombers accomplishments, occupation forces harassing civilian and well-chosen pieces of the Quran, are expertly assorted to feed a chain of resentment, odium and retaliation (Hoffman, 2006: 220-221). In this way, the group’s attitude goes from passive to active. In addition, media footage are released to states and private owned broadcasting companies to target the adversary. A supplementary rhetoric chronicle has been developed and conveyed through web sites, CDs/DVDs production and publications. All this efforts are meant to reach the organization’s members and supporters around the globe, surpassing countries’ borders, and continents. (Hoffman, 2006: 197-198); Rabasa et al, 2006: 164). In contrast to what happens in Muslim nations, where madrassas are the perfect environment for radicalization and for moulding new generations, in the west, where to communicate is a constitutional right, terrorist often exploit the disorganised vacuum offered by social media and the internet. There they target adolescent, diaspora and migrant communities ‘for propaganda, indoctrination, recruitment, and operations on the scale of the March 2004 Madrid terrorist attack’ (Rabasa et al, 2006: 164); Bott et al, 2009: 54-55-56-57-58-59) Springer et al, 2009: 133); The targeted societies, due to their own system which guarantees personal freedom, are rendered often defenceless (Bott et al, 2009: 54-55-56-57-58-59). ISIS. This terrorist group resembles many characteristics from others and in particular from al Qaeda from which has seen the genesis in Iraq, but adding a new dimension to the Jihad. In 2014, after having positioned his forces between western Iraq and eastern Syria, it self-named as the Caliphate, ruling on few millions of people in the area (Laub and Masters, 2015). As the word Caliphate indicates, it refers to the rigid Salafi concept of Islam already discussed previously. An extremely skilful media branch, coupled with filmed infinite ferocity and web based calls, have managed to appeal large numbers of foreign fighters that have joined the Islamic State – grossly 13,000. The Islamic State possibly expanded as consequence of Sunni marginalization in Iraq and Syria. In both cases, it happened due to the exclusion of Sunni from governance, and advantaging, in the case of Iraq the Shi'a political forces (Laub and Masters, 2015). As lesson learned from the al Qaeda/Islamic State experience so far, it can be clearly deducted that, al Qaeda has accomplished much more than probably expected in terms of disseminating the principles of the Jihad and inflicting pain to the west through martyrdom. By contrast, the Islamic State, after being a branch of al Qaeda in Iraq, took over, reaching for the first time of the modern terrorism era – non including the Taliban such as a more complex environment -, to establish a sharia ruled territory, in an area between progressing and moderate Arab/Muslim modern countries. In this paper, the spread and the expansion of Islamic terrorist groups has been approached in a systematic way. Some background on the history connected with the genesis of the phenomenon and the standing political situation, have posed the base for a journey in the Salafi doctrine and her evolution. The Salafi creed resulted as the Islamic terrorist’s manifesto and the driving force for the actions. Analysis of the objective spread for Islamic terrorist groups, has highlighted that the Iranian revolution and the Afghan war started it and contributed heavily to it. Particularly, the Afghan war spread some radicalized fighters around the world and posed the fundamentalists for the development of al Qaeda. The western invasions exacerbated the ongoing clash among the west and the Muslim world further biased from the terrorists’ messages. As a final possible reason for spread of Islamic terrorism, it has been established that weak governance of Muslim countries has a big responsibility. Concerning the expansion of Islamic terrorist groups, technology surely takes great part of the blame, in that it is exploited to reach boundaries that were never possible before, and more than this, in a blink of an eye. Among many, an important issue emerged through the references, is that young generations are exposed by social networks and the internet, to self and coerced radicalization, with the risk of even increasing the huge number of fighters joining networks like the one of the Islamic State. By contrast, the technical tools in the hands of western societies are not many. The only possible solution is the social prevention of these risks. Al Raffie D. (2012). Whose Hearts and Minds? Narratives and Counter-Narratives of Salafi Jihadism. [Online] Available from: https://blackboard.staffs.ac.uk/bbcswebdav/pid-1103181-dt-content-rid-1504035_1/courses/BB0000011429/BB0000011429_ImportedContent_20130812035108/304-936-1-PB.pdf, Journal of Terrorism Research, volume 3, Issue 2 - Autumn 2012, [Accessed: 30th March 2014]. Bott, C. et al, (2009). Recruitment & Radicalization of School-Aged Youth by international terrorist groups, Final Report, [Online] Available from: http://www.cleanitproject.eu/wp-content/uploads/2012/07/2009-recruitment-and-radicalization.pdf, Prepared for U.S. Department of Education Office of Safe and Drug-Free Schools, Arlington, VA: HOMELAND SECURITY INSTITUTE, [Accessed: 25th May 2015]. Goldstein Ferber, S. and Schweitzerand Y. (2005), Al-Qaeda and the Internationalization of Suicide Terrorism, [Online] Available from: http://www.inss.org.il/uploadimages/Import/%28FILE%291188301256.pdf, Memorandum No. 78 November 2005, The Jaffee Center for Strategic Studies (JCSS). Tel Aviv University, [Accessed: 20th March 2014]. Hayat, A. (2014). 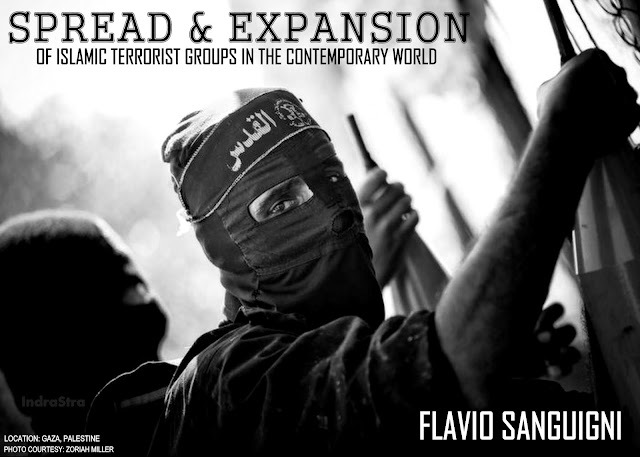 The diffusion of intra-Islamic violence and terrorism: the impact of the proliferation of Salafi/Wahhabi ideologies, [Online] Available from: http://www.rubincenter.org/wp-content/uploads/2014/07/v18n02a05_alvi_PDF.pdf, The Middle East Review of International Affairs (MERIA) Journal, Vol. 18, No 2 (Summer 2014), [Accessed: 20th May 2015]. Hoffman, B. (2006). Inside Terrorism, revised and expanded edition. New York: Columbia University Press. Huntington, S. (1993). The clash of civilizations?, [Online] Available from: https://www.foreignaffairs.com/articles/united-states/1993-06-01/clash-civilizations, Foreign Affairs; Summer 1993; 72, 3, p. 22-49, ABI/INFORM Global, [Accessed: 20th March 2015. Kiras, J. D. (2013). Irregular Warfare: Terrorism and Insurgency. In Wirtz, J. (et al) (2013), Strategy in the Contemporary World, 4th edition, chapter 9, p. 173-194. Oxford: Oxford University Press. Laub, Z. and Masters, J. (2015). The Islamic State, [Online] Available from:http://www.cfr.org/iraq/islamic-state/p14811?cid=ppc-Google-grant-isis_backgrounder&gclid=CLLVqPfLu8MCFQTLtAodWjwAsw, Council of Foreign Relations, Backgrounders [Accessed: 20th May 2015]. Lutz, B. and Lutz, J. (2013). Terrorism. In Collins, A. (ed) (2013), Contemporary Security Studies, 3rd edition, chapter 19, p. 273-288. Oxford: Oxford University Press. Migaux, P. (2007). The roots of Islamic radicalism. In Chaliand, G. and Blin, A. (ed), (2007), The history of terrorism from antiquity to al Qaeda, chapter 12, p. 255-313. Los Angeles: University of California Press. Pike, J. E. (2011), Lebanon Civil War 1975-1991, [Online] Available from: http://www.globalsecurity.org/military/world/war/lebanon.htm, page last modified: 11-07-2011 03:28:32 ZULU, [Accessed: 15th May 2015]. Rapoport, D. C. (2012). The four waves of modern terrorism. In Horgan, J.& Braddock, K (2012). Terrorism Studies: A Reader (pp. 41-60). London: Routledge. Reprinted from: Rapoport, D. C. (2004). Modern terror: the four waves. In A. Cronin & J. Ludes (Eds.) Attacking terrorism: Elements of a grand strategy (p. 46-73). Washington, DC: Georgetown University Press. Springer, D. R. et al, (2009). Islamic Radicalism and Global Jihad. Washington, D.C.: Georgetown University Press. Stout, M. (2009). In Search of Salafi Jihadist Strategic Thought: Mining the Words of the Terrorists, [Online] Available from: http://www.tandfonline.com/doi/abs/10.1080/10576100903185578#.VaFBWG3IlcU, Studies in Conflict & Terrorism, Volume 32, Issue 10-2009, p. 876 — 892, Routledge - Taylor & Francis Group, LLC [Accessed: 20th May 2015]. Rabasa, A. et al, (2006). Beyond al-Qaeda. Part 1. The global jihadist movement. [Online] Available from: http://www.rand.org/content/dam/rand/pubs/monographs/2006/RAND_MG429.pdf, Santa Monica, CA: Prepared for the United States Air Force at RAND Corporation. [Accessed: 25th May 2015].